FARNELL InOne has introduced a range of industrial hand cleaners from Septone, including the Orange Scrub cleaner. Orange Scrub is a heavy duty hand cleaner containing high quality citrus oils and a fast working fine grade pumice abrasive. It is designed to remove most industrial soils including dirt, mud, dusts, coal dusts, oils, greases and solvents. 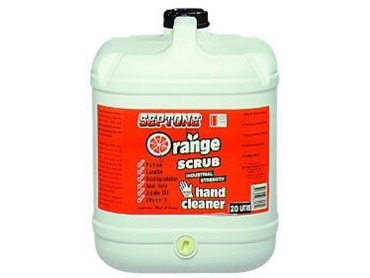 Orange Scrub, unlike most industrial strength cleaners, contains no petroleum solvents. Orange Scrub also provides natural moisturising to the skin through the incorporation of a lanolin derivative as well as aloe vera, Vitamin E and jojoba oil. The surfactants used in Orange Scrub are highly biodegradable and have been selected for their skin compatibility and low skin irritancy. Orange Scrub possesses a natural orange fragrance without the need for added perfume. The scrub comes in a 4L dispenser cartridge, 500ml squeeze pack, 5L dispenser pack and a 20L bulk pack.